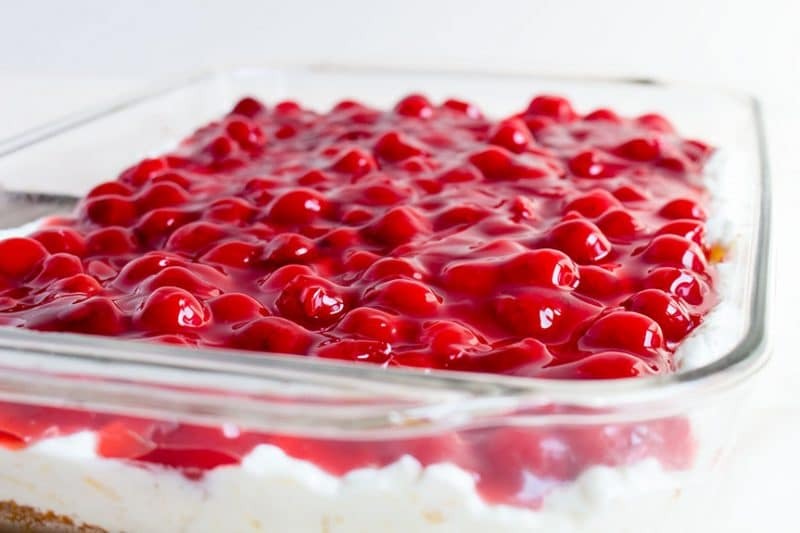 Quick Simple Cherry Delight Dessert is a wonderful and easy no-bake dessert. It has a graham cracker crust and a light and creamy filling with cream cheese and pineapple. Top it with canned pie filling. 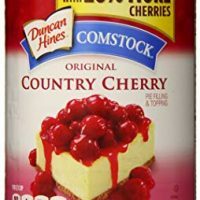 Obviously, we use cherry if it’s Cherry Delight, but it readily accepts any kind of fruit pie filling your family likes. Cherry Delight makes a nice presentation too! It’s great served at BBQs, picnics, and even holidays. It’s impressive when served in a glass 9 X 13 pan. 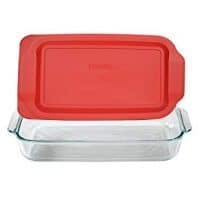 A disposable pan works just as well and you can throw it out when the pan is empty, or leave the leftovers without worrying if you will ever see your favorite pan again. Rarely have I had to leave leftovers though. I tried to double the crust once, I may have cracked a tooth. My mother-in-law Sharon knows I love to cook and would buy me any cookbook that people were selling at her workplace. You know, the ones that have fallen out of fashion (in favor of internet searches) that church groups, work groups, and charitable organizations used to put out. This recipe came from one of those, but the cookbook was long ago replaced by a handwritten copy. With that being said, I give a hat tip to my hometown of Kankakee, Illinois and whoever originally provided this recipe to whichever of the hundreds of cookbooks I used to own. For those of you who prefer to make your own graham cracker crumbs and are wondering how many graham crackers it takes to make graham cracker crumbs, I use about 16 full sheets of graham crackers for this crust. The graham crackers I used came in a 14.4-ounce box, with 3 sleeves containing 9 crackers each. I used 2 sleeves and I had one sleeve and one full sheet left. This box of crackers would take 2 full graham cracker sheets crushed to make 1/4 of a cup. Since most standard size boxes of graham crackers come with 3 sleeves, and most standard boxes are 14.4 ounce, you can safely assume that if you have 2 sleeves of graham crackers that you have run through the food processor, blender, or crushed with a baggie and a rolling pin, you will have enough crumbs for this recipe. Each sleeve of this brand was only 4.5 ounces on the scale with the wrapper on. I did not get 14.4 ounces of crackers in this box, I got 13.5 ounces. Each cracker was 1/2 ounce. Which means I used 8 ounces of cracker to get 2 full cups of graham cracker crumbs. If your box of crackers has a different number of crackers per sleeve, you can do some math and figure out exactly how many you need. I have another spare sleeve of graham cracker from a different brand that has 8 crackers in it. It weighed in at 4.1 ounces. Even though the crackers were a bit different in sizes, one was wider and shorter than the other, each of the cracker sheets weighs roughly 1/2 of an ounce. Unlike a standard pie crust, a graham cracker crust is a bit more forgiving. If you are a few tablespoons off in either direction, you will still have a decent graham cracker crust. If you have 8 graham crackers and crush them, you should have 1 cup of graham cracker crumbs. A small 0.1 or 0.2-ounce difference will not make or break your baking day. In case you are asking why I have two kinds of graham crackers, we feed them to the goats and sheep as treats. The easiest way to mix the filling is to make sure that the cream cheese is softened. The fastest way to softened cream cheese is to remove it from the box and the silver wrapper then cutting it into cubes before setting it aside. Separate the cream cheese cubes to allow more air to be able to circulate around the cream cheese. 30 minutes is generally all it takes using this method. Please don’t use the microwave or any hot water method for softening the cream cheese for this recipe. This is not a recipe that you are cooking or baking and melted cream cheese will not whip up as fluffy as simply softened cream. Yep, been there, done that. I dump my pineapple into a strainer and allow it to drain during this time too. If your nondairy whipped topping is not already thawed, this is the time to get it on the counter with the lid off as well. Any lumps in any of the mixture at this point will remain a lump of product in the finished product. 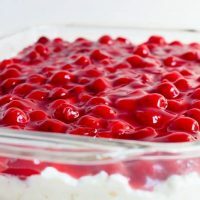 Quick Simple Cherry Delight Dessert - Quick, light and creamy pineapple and cherry dessert recipe. Mix graham cracker crumbs, sugar, and butter. Pat into the bottom of 9 X 13 cake pan. Bake in 375 degree F oven for 7 to 10 minutes, until lightly browned around the edges. Mix cream cheese until smooth, add powdered sugar. Mix in pineapple. Fold in the non-dairy topping. 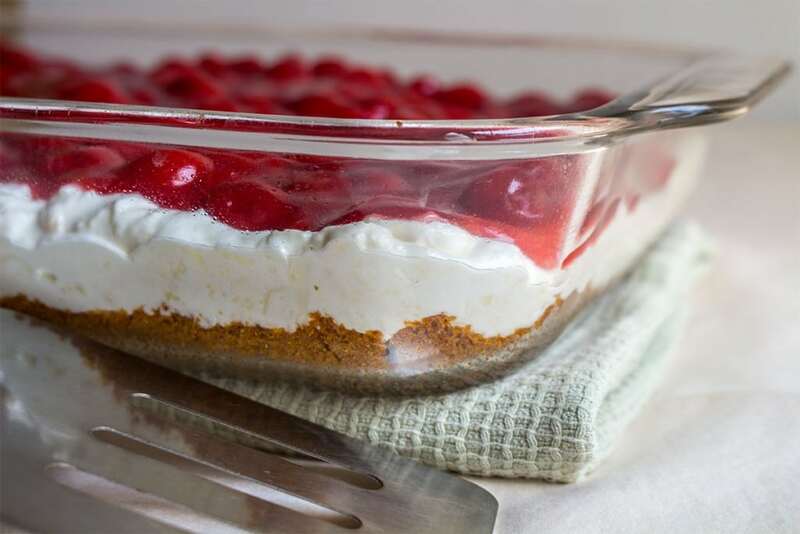 Spread over graham cracker crust. Gently pour and spread cherry pie filling over the top. Refrigerate at least 4 hours. Cook time provided does not include 4 hour refrigeration time.